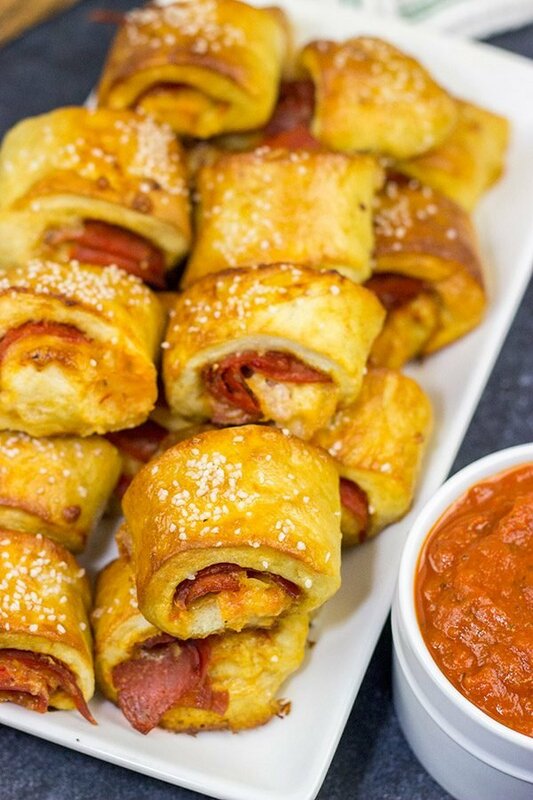 Pizza Stuffed Pretzel Bites - Tasty Gameday Appetizer! 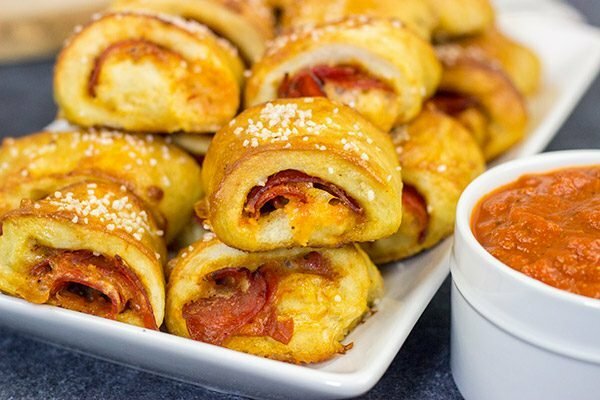 Filled with pepperoni, pizza sauce and 2 kinds of cheese, these Pizza Stuffed Pretzel Bites are the perfect appetizer for watching football! A few months ago (just before the start of this football season), a buddy and I hopped in the car and drove down to MetLife Stadium in East Rutherford, NJ (i.e. New York City) to catch a game. But this was a different kind of football game. AS Roma was in town playing an exhibition soccer match against Real Madrid. 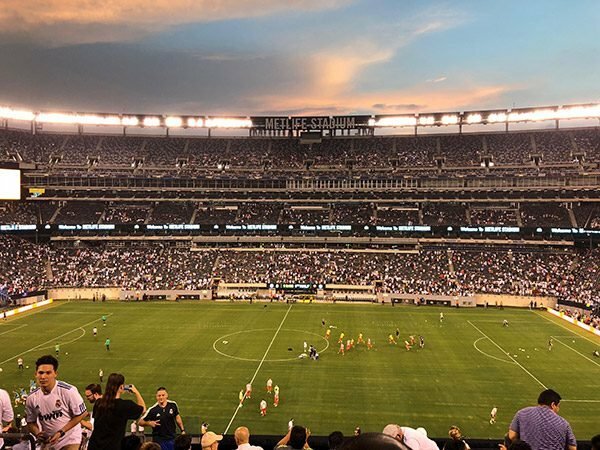 I’ve been an AS Roma fan every since I studied in Italy way back in college (too many years ago to admit now), and I couldn’t pass up the chance to see them play here in the U.S. The only other way to catch a Roma game would be to go to Italy. Ok, twist my arm there! But I can’t drive to Italy, and I can drive to East Rutherford. Despite dodging thunderstorms during the drive as well as the pre-game, we ended up having a blast. Roma lost 2-1, but I didn’t mind that. As I said, it was a preseason match, and they were up against one of the powerhouses of European football soccer football. But what shocked me about the game was the cost of concessions! Now I might be showing my age here, but a beer at MetLife Stadium was $12. $12! I can easily get a 6-pack of good beer at the store for that…and still have a few bucks left in my pocket. I love sports, but I don’t go to professional games very often. I didn’t mind the cost for this one-time occasion, but still. $12! The concession prices at MetLife Stadium got me thinking about the cost of food and drinks at sports games in general. Did you realize that a hot dog at the 2017 Super Bowl in Houston cost $8? And the cost of a soda + pretzel combo? $17. Seriously?! That soda and pretzel probably cost less than 50¢. I get that there are other costs like labor, fees, etc, but still! $17 for a soda and pretzel? C’mon man! For the record, the new Atlanta Falcons stadium charged 50% less for concessions in their first year (2018)…and they ended up making 16% more compared to the previous year. The lesson? Happy fans buy more! Homemade pretzels are incredibly easy to make, and they’re a staple whenever I get together with friends to watch a game. If you’ve never made homemade soft pretzels, do yourself a favor and make a batch. They’re easy, and they’re delicious! 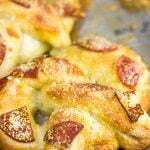 I posted this recipe for Classic Soft Pretzels a few years back, and that post still gets a bunch of visitors around this time every year. I assume folks are looking up recipes for their Super Bowl parties and such. I know I am! This year, I decided to get creative and turn those soft pretzels into Pizza Stuffed Pretzel Bites. These pretzel bites are what happens when a truck carrying pizzas crashes into a truck carrying soft pretzels. 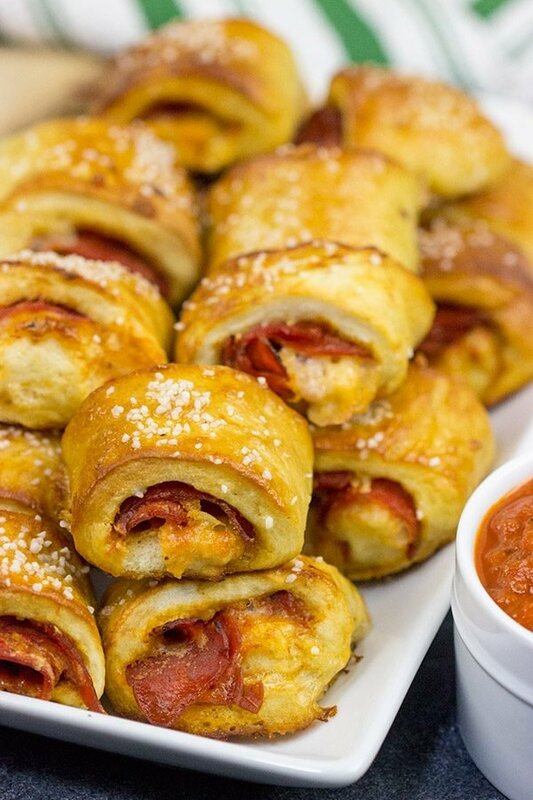 You’ve got the chewy pretzels wrapped around a cheesy, pepperoni-y filling…and don’t forget the salted top! These pretzel bites were a huge hit in our house! I hope you enjoy these homemade pretzel bites as much as we do! Cheers, friends! Using a countertop mixer, combine the first 5 dough ingredients (flour, salt, brown sugar, yeast, and warm water); mix on medium speed for 5-6 minutes. Meanwhile, combine the boiling water with the baking soda; mix until well combined. Set aside to cool. Once dough has risen, divide into 2 equal pieces. Roll one piece of dough into a ~15” long rope. Layer half of pepperoni evenly down center of dough and then sprinkle half of mozzarella and Parmesan cheeses on top. Roll the dough up widthwise to create a long rope; pinch edges tightly to seal. Repeat process with remaining piece of dough. Slice each roll into 1” pieces. Place pretzel bites into baking soda/water mixture for 2 minutes (spoon water over the top of the pretzel if it is not fully covered by the water). Transfer each pretzel bite to a parchment-lined baking sheets. Sprinkle bites with coarse salt, and allow the pretzels to rest for 10 minutes uncovered. Bake at 475°F for 9-11 minutes, or until pretzels are golden brown in color. Remove pretzels from oven and brush with melted butter. 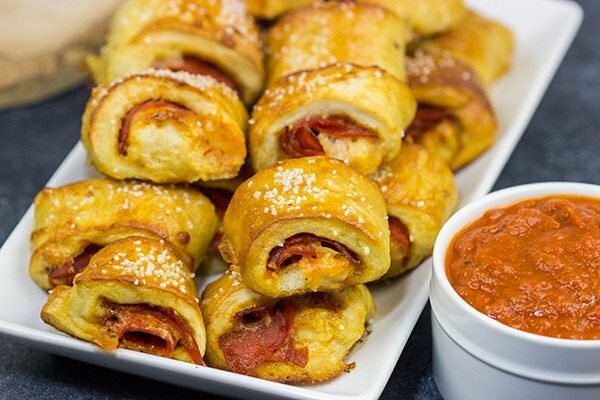 Serve with remaining pizza sauce for dipping. You are definitely in touch with my love-to-snack side, my friend! These look awesome! I’m always on the lookout for snack foods for my kids that they can grab out of the freezer and heat up (something like a hot pocket but not a hot pocket). These would fit the bill perfectly! Although I doubt many of them would last long enough to make it to the freezer! Yes! I love that we share a snack/comfort food vibe, Kelly! Have you ever made soft pretzels? 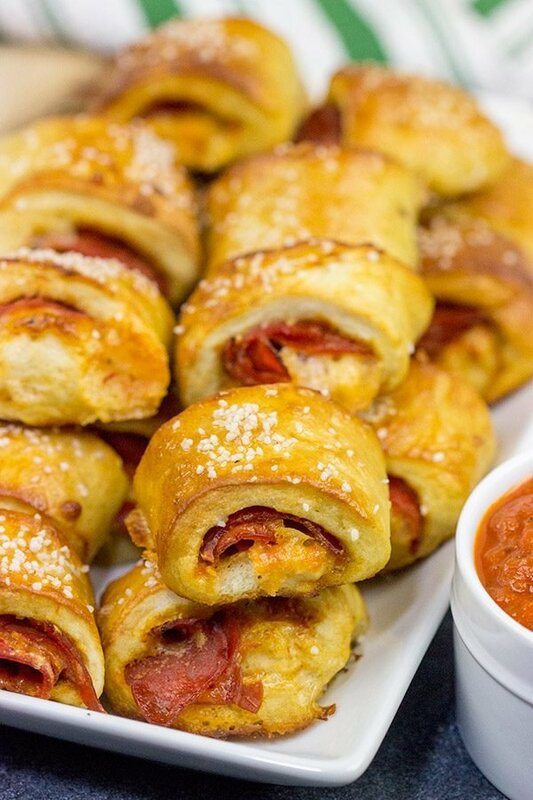 They’re surprisingly easy, and then you can do cool stuff like stuff ’em full of pepperoni. 🙂 I highly suspect these won’t make it to the freezer either. Just sayin’! It’s like you’ve read my mind. For the last week I’ve been craving stuffed pretzels so badly I can hardly stand it–I almost drove to the mall last night just to get one because I haven’t had time to actually make a batch. But these look faster to make than the pretzels I’ve made in the past so I might be able to feed my craving a little easier. Hooray! Have a great weekend! No way! Sounds like you’re living my life with the constant pretzel craving. I mean a good soft pretzel really is hard to beat! They’re not that hard to make at home…so I say you should make a batch this weekend. And maybe stuff ’em full of our favorite pizza toppings while you’re at it. 🙂 Hope you have a great weekend, Kelsie! Hi David! I haven’t made pretzels in years, but as I remember it was a lot of fun! These sound like fun to make and more fun to eat! Did you have any problem with cheese oozing out during the water bath? You should totally make a batch of pretzels this weekend, Dorothy! (Assuming you’re back up on your feet, that is.) So I didn’t have any problem with the cheese oozing out, but I did make sure to seal the seams well and I also use a cold water bath. Just try not to agitate the pretzels too much while in the water. I hope you are doing well, my friend! Have a great weekend! What a wonderful treat not just for the games. My niece and her husband would have loved those stuffed pretzels . Ah, yes, your niece and her husband would have enjoyed these indeed! Maybe you’ll have to make a batch and send her a photo. Maybe that’ll entice her to come back and visit again? 🙂 I hope you had fun visiting with them, and I also hope you have a great weekend ahead! Thanks, Gerlinde! Hah! That sounds like a true Giants fan talking right there. MetLife is only a couple hours drive for me, but I’ve never been down to a Giants game. Maybe if they host New Orleans some year…we’ll see. Also, homemade pretzels? Yum! They do involve yeast, but I have 100% faith that you can make these, Mary! 🙂 Happy Sunday, my friend! Another delicious, comfort food snack. I might go as far as to call it a meal. Just give me a side salad and I’m all set. Game day or not, I’m in. David, glad to hear you have an appreciation for a proper football game. Needless to say, in Sweden, there are two major sports, football (as in soccer) and ice hockey. 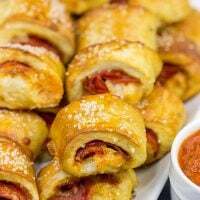 We’re into the ice just now and we have a big Malmö Red Hawks match this weekend and your pizza pretzels and you muffin stromboli will be served. I think my Swedish friend will gobble them up. Whew! That’s some crazy prices. Better stay home and make all your delicious favorites and buy your own beer! Love these pretzel bites. That’s a whole lot of goodness rolled into those pretzels. I agree, the cost of food and drinks at sporting events has gotten out of control! It’s nutty, especially because tickets aren’t cheap either. You make a great point about ticket prices, too, Nicole. Going to a sporting event is definitely a special treat…they’ve gotten way too expensive to go more than that! And, yes, that soccer game in Europe is absolutely on my bucket list. How crazy would that be to watch say a World Cup game over there?? 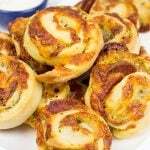 It’s probably best that you don’t invite me over to watch football, David, because you’d have to make a double-batch of these pretzel pizza bites just for me. Hey, I think that can be arranged, Jeff. I’ll just make a 4x batch. 2 for you. 2 for me. Deal? Ha ha! David you’re a man after my own heart moaning about the cost of food and drinks at the footy game. Seriously though I changed your dollars to pounds and it was really expensive! Yes, better to make your own like your delicious looking pizza stuffed pretzel bites. And MUCH cheaper too! 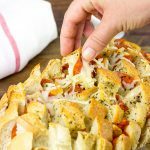 Hey, I love garlic bread, too, Mary…that’s a difficult one to top! But take warm pretzels and stuff ’em with pepperoni? That’s a darned good app, too! 🙂 Thanks so much for the kind words!